Unlike other government decisions – say tax rates or defining the nature of marriage – those affecting immigration are both irreversible and profound. In that light, today marks a half-century since the passage of one of the least heralded but most significant pieces of legislation in American history. 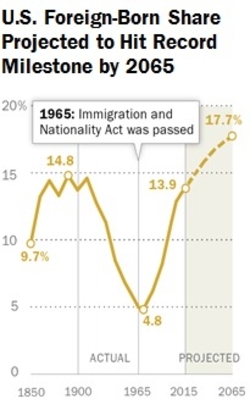 That would be the Immigration and Naturalization Act of 1965, known as the Hart-Celler Act, which ended the highly restrictive terms of the prior 1924 legislation, opening the United States to larger and more varied immigration. Pew's percentages of the U.S. population. Put in numerical terms, according to the Pew Research Center, the United States was 84 percent white, 11 percent black, 4 percent Hispanic, and 1 percent Asian in 1965; today, it is 62 percent white, 12 percent black, 18 percent Hispanic and 6 percent Asian, and 2 percent other. The center projects that in 2065, the population will be 46 percent white, 13 percent black, 24 percent Hispanics, 14 percent Asian, and 3 percent other. 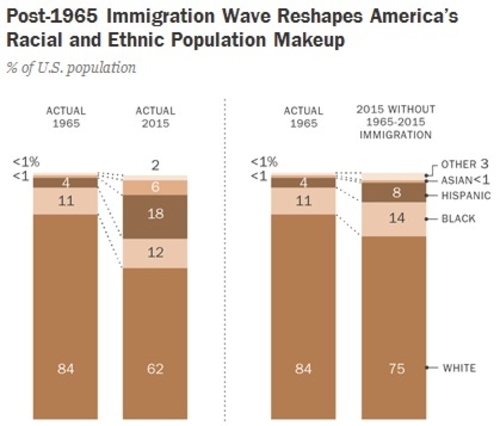 As for numbers of immigrants, they totaled 5 percent of the population in 1965, 14 percent today, and are projected to make up 18 percent in 2065. Theses changes have profound implications for the country; as Jeff Melnick of the University of Massachusetts puts it, "You'd have to go really far to find an area of American life that's untouched by the realities of the '65 law." Already in 1990, or only 25 years after Hart-Celler, Ben J. Wattenberg celebrated this change, calling the United States "The First Universal Nation." Many others join him in seeing population diversity as inherently positive. But I take a darker view. As multiculturalism takes hold, I wonder if classic American culture, with its stress on individualism and freedom, will survive. As communication and transportation costs shrivel, maintaining bonds to other countries gets easier, permitting newcomers to opt out of critical portions of American life. I watch how the American power of acculturation weakens and a once-unified country becomes increasingly riven. I worry that the success of the United States will bring in so many from the world at large that they eventually undermine that very success. Why Revoke Tariq Ramadan's U.S. Visa?